In this pilot study, described in a paper published in Journal of Neural Engineering, epilepsy patients’ short-term memory performance showed a 35 to 37 percent improvement over baseline measurements, as shown in this video. The research, funded by the U.S. Defense Advanced Research Projects Agency (DARPA), offers evidence supporting pioneering research by USC scientist Theodore Berger, Ph.D. (a co-author of the paper), on an electronic system for restoring memory in rats (reported on KurzweilAI in 2011). “This is the first time scientists have been able to identify a patient’s own brain-cell code or pattern for memory and, in essence, ‘write in’ that code to make existing memory work better — an important first step in potentially restoring memory loss,” said the paper’s lead author Robert Hampson, Ph.D., professor of physiology/pharmacology and neurology at Wake Forest Baptist. The study focused on improving episodic memory (information that is new and useful for a short period of time, such as where you parked your car on any given day) — the most common type of memory loss in people with Alzheimer’s disease, stroke, and head injury. 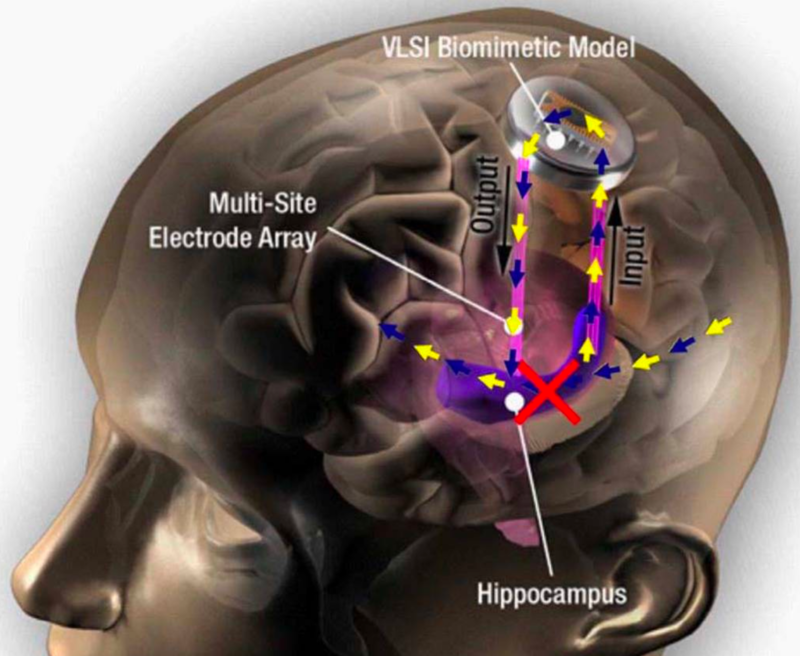 The researchers enrolled epilepsy patients at Wake Forest Baptist who were participating in a diagnostic brain-mapping procedure that used surgically implanted electrodes placed in various parts of the brain to pinpoint the origin of the patients’ seizures. “We showed that we could tap into a patient’s own memory content, reinforce it, and feed it back to the patient,” Hampson said. “Even when a person’s memory is impaired, it is possible to identify the neural firing patterns that indicate correct memory formation and separate them from the patterns that are incorrect. We can then feed in the correct patterns to assist the patient’s brain in accurately forming new memories, not as a replacement for innate memory function, but as a boost to it. The current study is built on more than 20 years of preclinical research on memory codes led by Sam Deadwyler, Ph.D., professor of physiology and pharmacology at Wake Forest Baptist, along with Hampson, Berger, and Song. The preclinical work applied the same type of stimulation to restore and facilitate memory in animal models using the MIMO system, which was developed at USC. * In a second test, participants were shown a highly distinctive photographic image, followed by a short delay, and asked to identify the first photo out of four or five others on the screen. The memory trials were repeated with different images while the neural patterns were recorded during the testing process to identify and deliver correct-answer codes. After another longer delay, Hampson’s team showed the participants sets of three pictures at a time with both an original and new photos included in the sets, and asked the patients to identify the original photos, which had been seen up to 75 minutes earlier. When stimulated with the correct-answer codes, study participants showed a 35 percent improvement in memory over baseline. Objective. We demonstrate here the first successful implementation in humans of a proof-of-concept system for restoring and improving memory function via facilitation of memory encoding using the patient’s own hippocampal spatiotemporal neural codes for memory. Memory in humans is subject to disruption by drugs, disease and brain injury, yet previous attempts to restore or rescue memory function in humans typically involved only nonspecific, modulation of brain areas and neural systems related to memory retrieval. Approach. We have constructed a model of processes by which the hippocampus encodes memory items via spatiotemporal firing of neural ensembles that underlie the successful encoding of short-term memory. A nonlinear multi-input, multi-output (MIMO) model of hippocampal CA3 and CA1 neural firing is computed that predicts activation patterns of CA1 neurons during the encoding (sample) phase of a delayed match-to-sample (DMS) human short-term memory task. Main results. MIMO model-derived electrical stimulation delivered to the same CA1 locations during the sample phase of DMS trials facilitated short-term/working memory by 37% during the task. Longer term memory retention was also tested in the same human subjects with a delayed recognition (DR) task that utilized images from the DMS task, along with images that were not from the task. Across the subjects, the stimulated trials exhibited significant improvement (35%) in both short-term and long-term retention of visual information. Significance. These results demonstrate the facilitation of memory encoding which is an important feature for the construction of an implantable neural prosthetic to improve human memory.